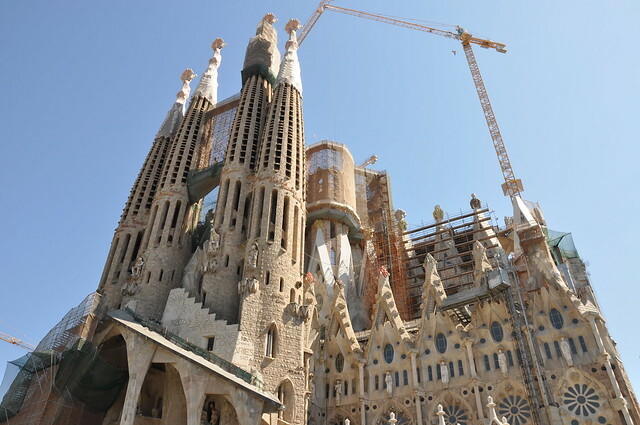 Antoni Gaudi is an amazing architect, and his greatest masterpiece has to be the incomplete Sagrada Familia. 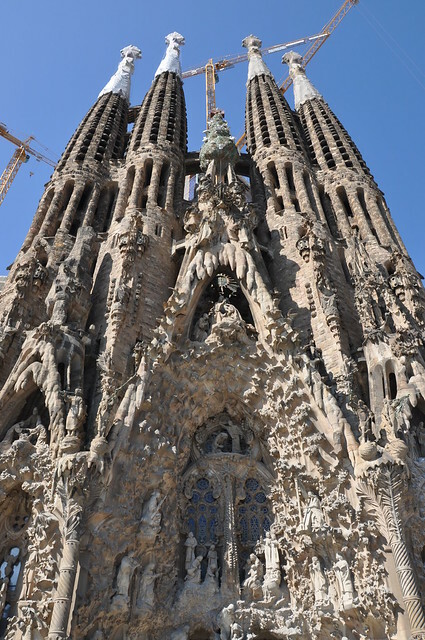 Gaudi devoted his last years to the project, and at the time of his death at age 73 in 1926 less than a quarter of the project was complete. 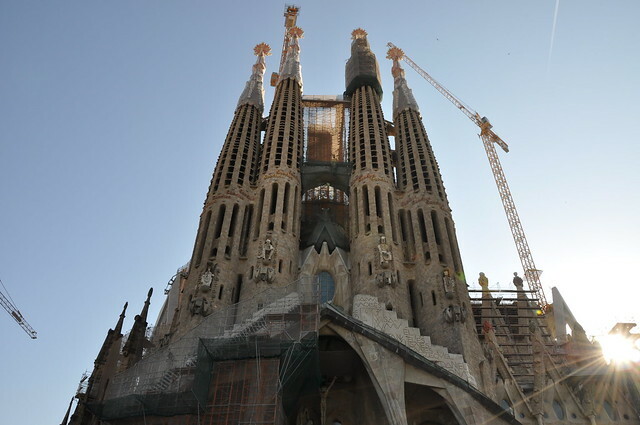 Sagrada Familia’s construction progressed slowly, as it relied on private donations and was interrupted by the Spanish Civil War, only to resume intermittent progress in the 1950s. 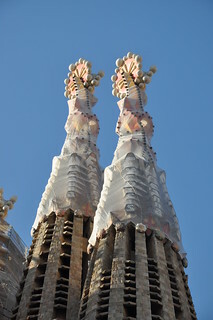 Despite the scaffolding, it was an impressive and immense building. Stunning and inspirational. Really, for a church, I thought it was amazing. “I want it to make people afraid, and to achieve that I will not spare chiaroscuro, projecting elements and hollows, all of which have the most sombre effect” for the purpose of “giving an idea of the cruelty of the Sacrifice”. This is only a third of the final facade, and it’s certainly sombre. 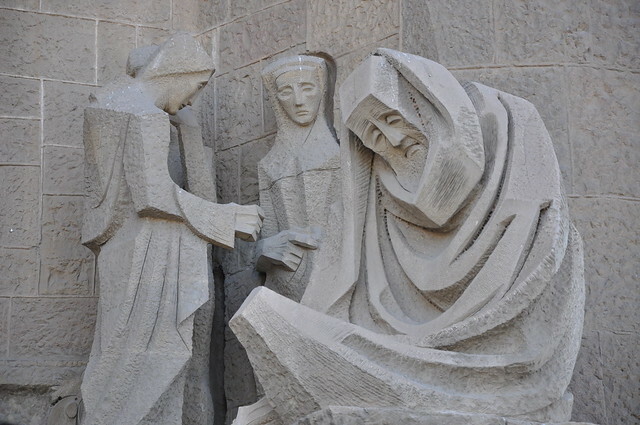 On the opposite side of the cathedral is the Nativity Facade. In contrast to cold hard Passion facade, this facade is lively, busy and attractive. 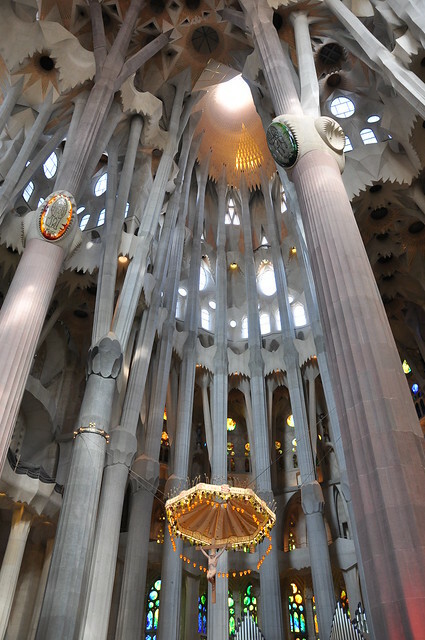 It’s dedicated to the birth of Christ, and bears the most direct Gaudi influence. 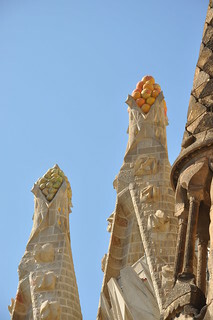 Characteristic of Gaudi’s naturalistic style, the sculptures are ornately arranged and decorated with scenes and images from nature, each a symbol in their own manner. 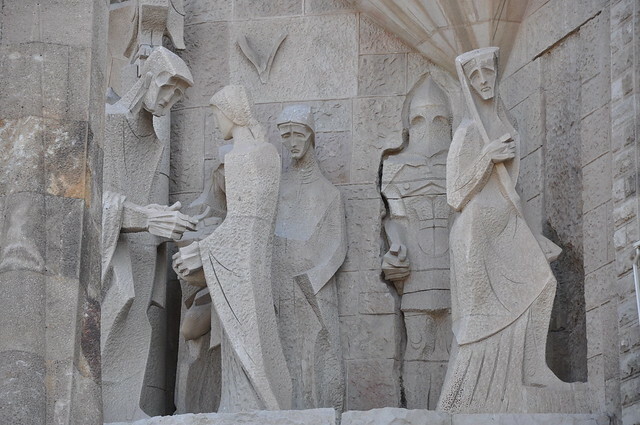 Gaudi originally wanted every statue and figure to be painted. There’s so many figures – it would be quite a task to paint all of them! Maybe they will get it done in the future, sometime. But the star of the show is really the Nave itself. 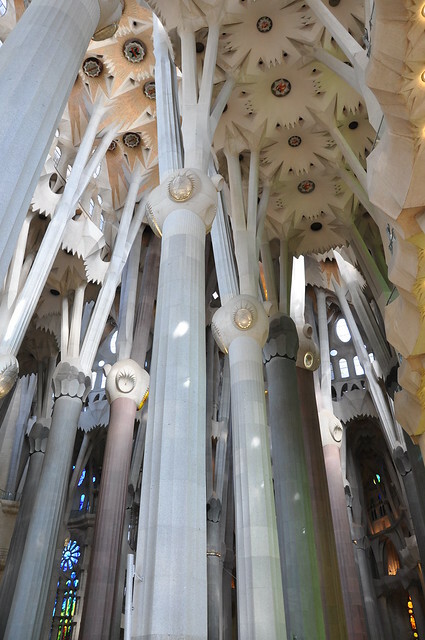 It’s 45m high and filled with huge columns that Gaudi intended to mimic trees and branches. I was in awe. There were huge stone trees inside this building. Trees! Inside the building! 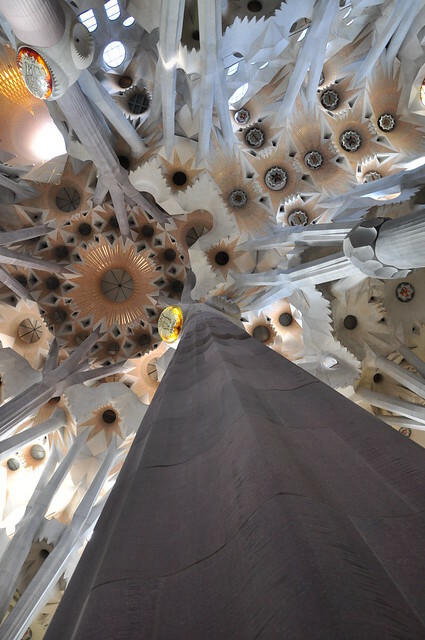 The ‘branches’ of the trees distribute the load of the Nave ceiling, but also the ‘trunks’ changed shape slightly from the floor to the ceiling. 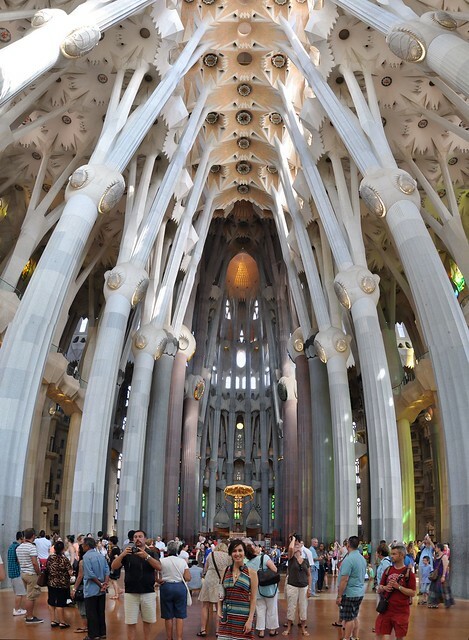 The base of the columns are almost square then evolve into hexagons and eventually a circle. 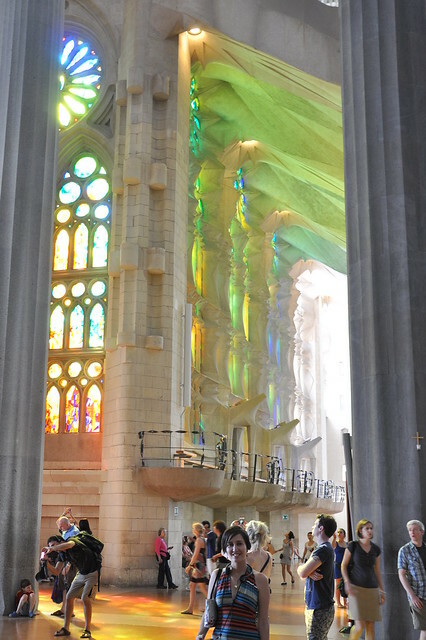 Also cool is that the columns are different colours because of the different stones used depending on the load of the structure above. Neat! The patterned ceilings are meant to be like leaves at the top of the branches. 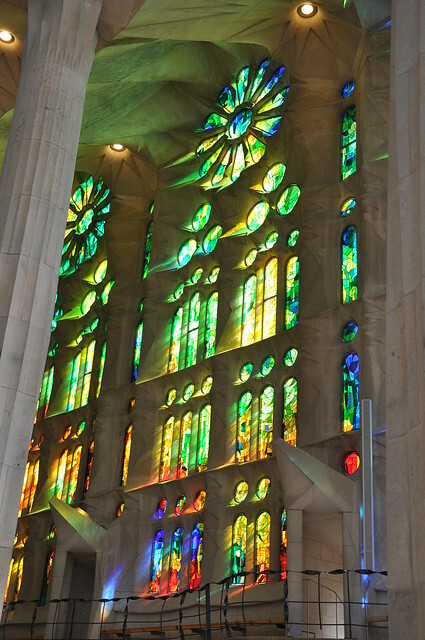 It was so refreshing to be in a place of worship that was colourful, inspiring and spacious for the building itself. It was a joy to explore all the corners. 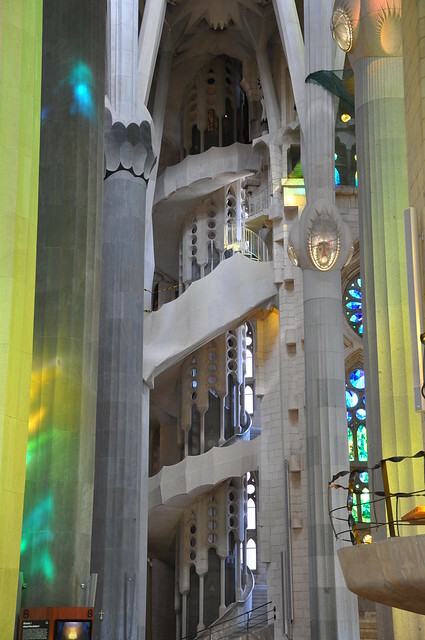 A spiral staircase, glowing stained glass windows and columns, columns and more columns. Wonderful. The whole building was wonderful. 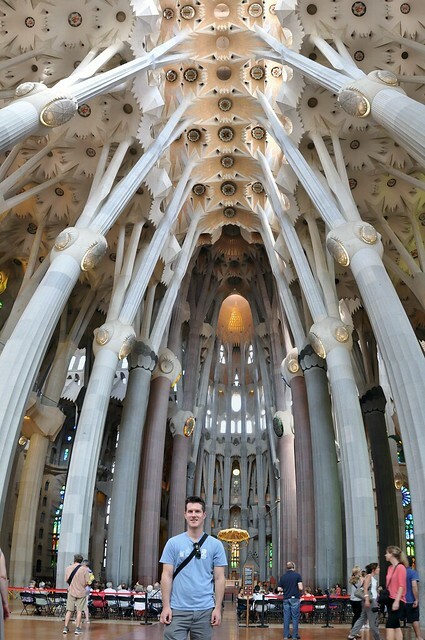 It’s official – who needs boring pillars, straight support beams and flat ceilings. I want architectural imagination in my future home, not just paint and furniture. 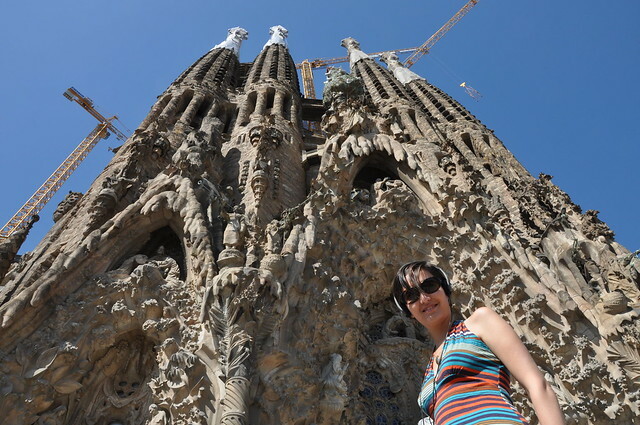 Barcelona was amazing, especially all of Gaudi’s works. Consider me inspired. 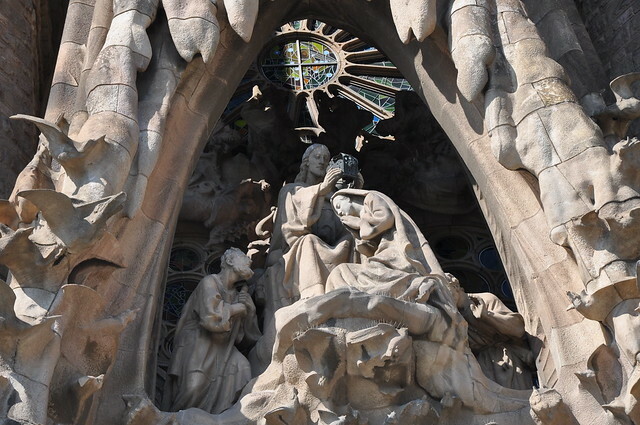 Our family walked around the outside of the Sagrada Familia when visiting Barcelona last spring. 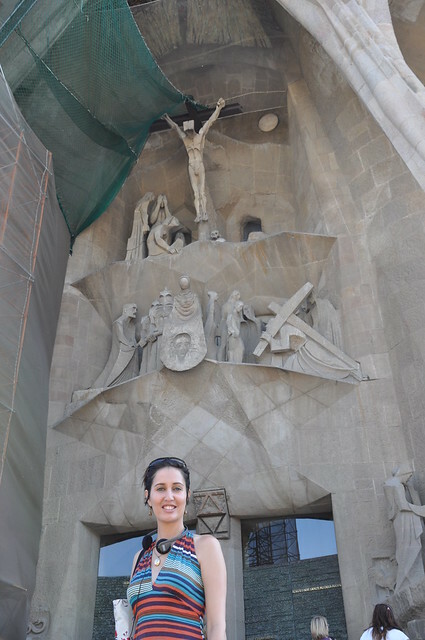 We didn’t have time to view the inside but thanks to your excellent photos, now we have! Thanks for sharing!